Guinea went out of the Fifa U-17 World Cup in Chile on Friday after a 3-1 defeat to Brazil in their final match of group B.
Brazil held on for the victory despite being reduced to ten men at half-time after one of their goal-scorers, Lincoln, was sent off. It was Lincoln who put Brazil 1-nil up with a penalty. Leandro and Arthur added to Brazil's scoreline with Morlaye Sylla snatching a consolation goal for Guinea late on. Brazil's opener came from the spot in the 15th minute after Leandro was brought down in the box by Guinea goalkeeper Moussa Camara. 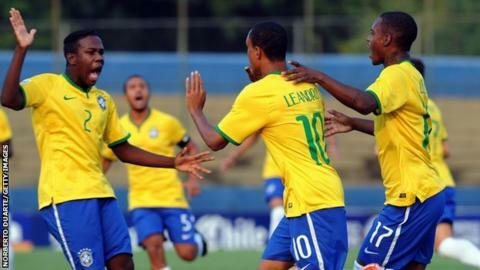 Leandro ensured that Brazil's lead was doubled after a goal in the 33rd minute. Brazil went into the break 2-0 up but had to play the second half with ten men after Lincoln's sending off. Guinea failed to capitalise on their advantage, and their hopes all but faded when Brazil added a third in the 67th minute through Arthur. But the Guineans managed to pull one goal back seven minutes from time, when Morlaye Sylla hit a fine individual effort. The result left Guinea bottom of group B, with Brazil securing their place in the last 16. Nigeria lost their first match of the group phase, but still finished top of group A, despite going down 2-1 to Croatia. Victor Osimhen put the Golden Eaglets ahead after 20 minutes. But second half goals from Josip Brekalo and Karlo Majic gave Croatia the win which put them through to the next phase alongside Nigeria.